EC been looking good for an awesome storm outbreak in a week or so. GFS has a bit of rain and troughy stuff, but nothing too amazing just yet. Access looks pretty shhiite. Im sure everyone would be pretty stoked if the latest EC comes off. EC is insane...clearly an early Christmas pressie! Cicadas and leaf blowers, it must be Summer. I see we got a bit of rain overnight from that NE stream, mostly just a millimetre or two. It's now sunny with scattered puffy white clouds and a light NE'er which will probably get a bit blowy later. Does at it really matter about someone's political views, it's a weather forum ffs. The longer you wait for storms, the more you appreciate them. Just looking the the Charts there is a huge divergence between EPS and EC. I wouldn't straight away back this pattern, because as you would've all seen there is a TC in the GOC at the same time which doesn't sit right with me. Unless there is another round Sudden Stratospheric Warming on the cards. A very peculiar pattern, but peculiar is what we need. Something is triggering EC - it's unusual for it to be so bullish. Usually it's that quiet kid in the corner. We're more likely to have a TC in the GOC given the set-up in the tropics, not sure about that big cut-off over the SE. Though my money is on a tropical system invigorating a deep inland trough at some point within the next 3 weeks. QLD to get plenty in the next week or so. EC is still going for a trough / low moving across NSW late next week, with widespread heavy rainfalls. A similar event us shown in Access towards the end of its run, although later and less intense. GFS also shows something similar. So the models seem to be agreeing on widespread significant rain in NSW in 7-10 days' time, but disagree on the details. Will be interesting to keep an eye on it. If ACCESS is on board then it’s a goer. GFS is always off playing in the mud. Looks very very interesting and promising. Will be some substantial totals to finish the year off if that happens. 00z GFS doesn’t look that bad Steve? GFS doesn't look bad unless you don't want rain. 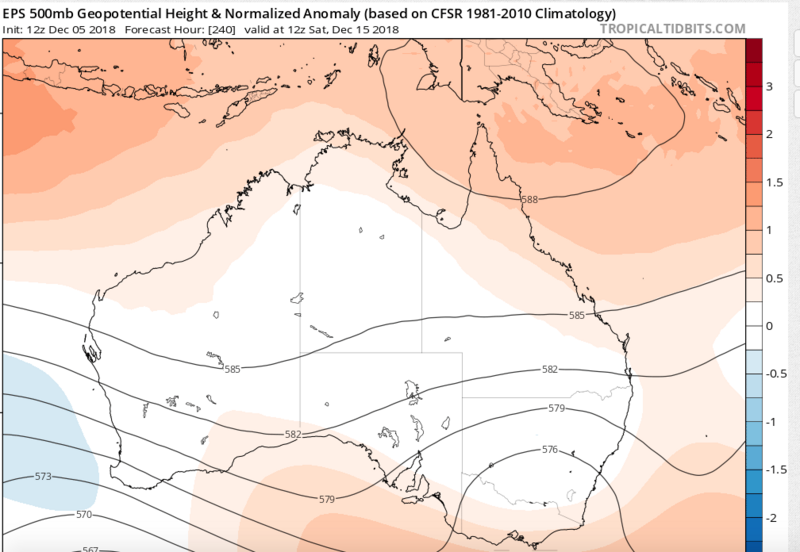 It shows a splodge of 20+ mm falls across the middle if the State from the far West to the Blue Mountains next Thursday, with bullseyes of 40+, up to 80 on the Central Tablelands. The following day, there's a broad band of falls across the coast and Tablelands. It looks warm and stormy, probably with hit and miss heavy falls, so not bad. It does look likely that there will be widespread heavy falls late next week. Exactly where and when is still up down to how the butterflies flap their wings. Access is a go from the charts. Also EC has been upgraded in terms of rainfall totals. EPS is beginning to back the upper low over NSW as well. That sea gale already going at it pretty early, gusting over 50km/h on parts of the coast. Wow just wow at EC it keeps upgrading. Now with a tropical low (Ex-Owen?) reaching the north coast! MJO and Sam doing its thing again. This time no cut off low. Interesting. 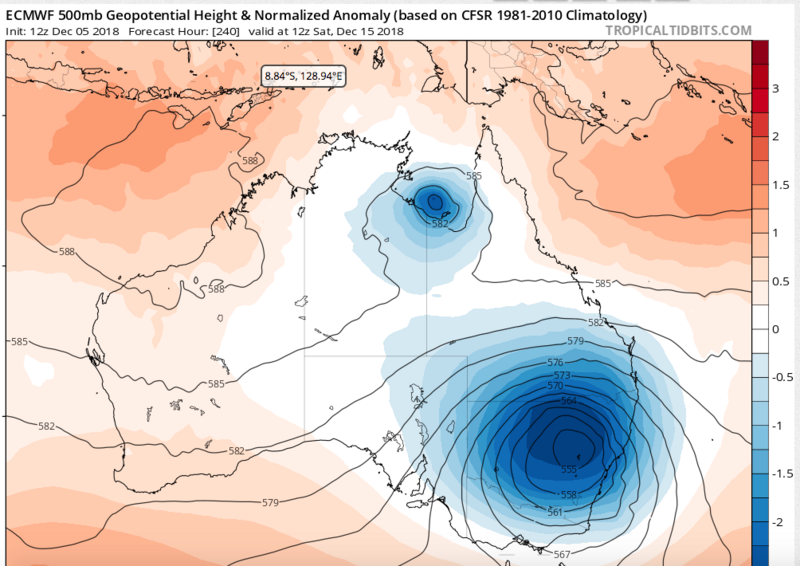 EC persisting with its forecast of significant widespread rains for whole of eastern Aus! GFS upgraded as well. ACCESS downgraded. round of applause for EC if it holds....was onto it very early. If EC comes off it’ll be a game changer for many areas esp for summer. 5 registered (samboz, LonnyDave, Vinnie, Dr Philosophy, 1 invisible), 57 Guests and 4 Spiders online. Generated in 0.683 seconds in which 0.668 seconds were spent on a total of 14 queries. Zlib compression disabled.